Resources from the Global South extracted by Europeans were used to fuel the biggest wars and conflicts of all time...[T]hose resources then helped build your peace and prosperity. I challenge [European governments] to be...consistent actor[s] for peace also beyond Europe, taking your part of responsibility so that resources in Africa, Asia and Latin America no longer fuel conflict on our continents, but rather contribute to our own prosperity. When it comes to European companies trading in our resources, we hope that the draft “conflict minerals” regulation...will be at least as strict as our own supply chain due diligence legislation...Together with 70 fellow bishops from four continents, I have signed a Church Leaders’ statement, supported by the international alliance of Catholic development agencies CIDSE, highlighting aspects to be strengthened if the regulation is to bring tangible change to suffering communities. We ask...European governments to meet the expectations of EU consumers, who want assurances that the resources in their mobile phones, computers or cars are not linked to human right violations and conflicts. As the European Parliament prepares to debate legislation on responsible mineral sourcing (“conflict minerals”), 70 Catholic bishops from around the world are urging the EU to make the legislation’s requirements consistent in scope and binding for companies, rather than the current voluntary approach. In a joint statement, supported by CIDSE, the international alliance of Catholic development agencies, they warn that European citizens expect guarantees that they are not complicit in financing conflict and human rights abuses. Walk Free action: "Demand Strong EU Rules on Conflict Minerals"
The European Commission is offering up a voluntary scheme [on conflict minerals] - meaning most companies won’t even have to abide by it. Plus, it only covers a paltry 0.05% of European companies involved in the trade. 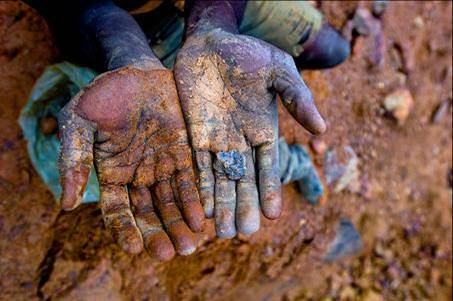 It is unlikely to have any significant impact on the trade in conflict minerals. You still won’t know if the companies selling your favourite purchases are acting responsibly.Parliamentarians, alongside our governments, must overhaul the law in order to change the way companies source natural resources from conflict-affected areas. First and foremost, it needs to be binding. But it also needs to cover enough companies to be meaningful.Join our campaign and tell your MEP that now is the time to break the link between conflict minerals and our favourite consumer goods. The time to act is now.